The Lord wants us on the other side of the wall and the question is how are we going to get there? And the answer is, only through the Cross. Everything we will teach you in LeaderVision, everything that we will teach you in the Seven Realities of the Altared Heart will bring us to the same place. Only through the Cross. Only the Cross gets us through the wall. (RECAP) And my friends, only brokenness and resurrection will make the difference. And you see, God brought me to that wall to bring me to a place where I realized the fullness of His grace. It was quite amazing for me. I read Mere Christianity by C.S. Lewis and I came to a chapter, I think it's chapter 8 in that book. It was like an autobiography for me. In which he describes issues of competition. And he showed that the essence of competition is comparison and I would compare myself, I would compare myself as a communicator, I would compare myself in what I had accomplished. And If I thought I were successful, that was great. And if I thought I failed, I was devastated. Have you been there? Some of you have, I know. And I still remember laying that book down. I was going to go jog. And I laid that book down and said, "Alright Lord, though this chapter on competition C.S. Lewis has shown me that competition is pride. It's the essence of pride. So Lord, I know through coming to this wall of inadequacy, I'm a proud man. But I made another discovery. But You have given me gifts." See, the amazing thing for me was this. I thought God was done with me. I think my business friends have felt that way at times. As God has pointed out sin in their lives, He has gotten their attention through the economy or through the slow-down of their business and they have realized there's sin in my life. There's fear that drives me. And God is done with me, that's what I thought. But I made this most amazing discovery. God was only getting started with me. And that's when I realized how great His grace is. And I want you to understand this - that through the Seven Realities of the Altared Heart, we are headed to the Cross and through the Cross we are headed to Grace. And I want you to understand as leaders who are at the wall of inadequacy, as leaders to whom Jesus has said, "You give them something to eat." And you wander through the crowd, you've got five loaves and two fish and there's no way you can do it…I want you to understand that through the Cross there is the grace to become the kind of leader you never imagined possible. 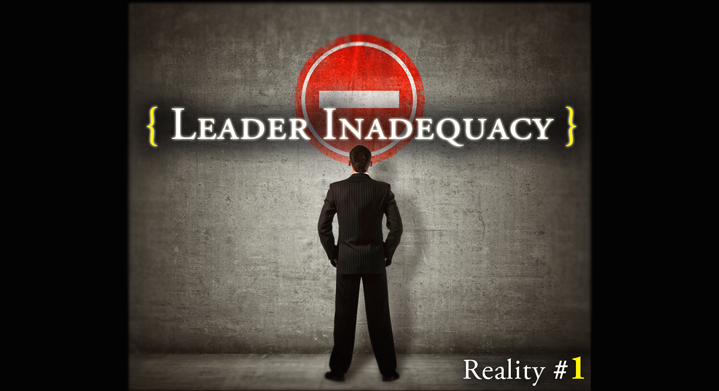 And I want you to understand that leadership begin when we own our inadequacy. You know, we spend all our lives trying to prove we are adequate, trying to prove to the people we are leading, "I've got the answers, I know the way, follow me!" And the problem is, they know we don't have the answers. They know we don't have the way, but we're all in this dance of death together. The only solution, the only solution is to give up control and enter into trust. Nothing scares us more. As leaders, we feel as if we must be in control. We spend our whole lives trying to get into control and we're always chasing an illusive goal that just leads us further and further and further into the darkness of our inadequacy. If being in a place of desperate dependence is only an occasional need for you and if you are working out of your resources and this is your pattern, then you don't understand what it means to serves Christ and feed the five thousand. And in fact, you are always somehow covering up your inadequacy. The point of this miracle is that this is the norm in serving Christ. Not the occasional, not the unusual, it's the norm. You are always up against the wall of inadequacy because what i can tell you is this Jesus can never give you something you can do. It's contrary to Who He is. He can only give you supernatural responsibilities. That's all He has to offer. That's the greatness, that's the greatness of being a leader for Him. You are called to do things that you cannot do, that you could never do, but He can. That's the challenge, that's the excitement, that's the adventure. So I call you to remember Reality #1: You must do what you cannot do with what you do not have for the rest of your life. And no matter what, you never will have the resources to do what Jesus calls you to do. You must do what you cannot do with what you do not have for the rest of your life. Right now I call on you to take a deeper step than ever in putting your heart on the altar of God in saying, "O.K., Lord, I'm going to stop trying to prove I'm adequate. I'm going to stop trying to do what You're giving me to do. I'm going to trust You. Here are the five loaves, here are the two fish, they're in Your hands, put in my hands what you want me to have, and I will serve You. You must do what you cannot do with what you do not have for the rest of your life.